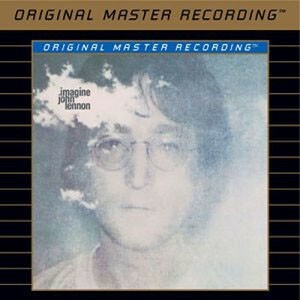 Gold Standard: Mobile Fidelity's reissue of John Lennon's 'Imagine' marks a revitalization for the Sebastopol company. Before closing its doors in 1999, the same year the label introduced its first SACD title and after 40 years in the record business, Mobile Fidelity Sound Laboratory set the gold standard in the audiophile industry--literally. During its respected tenure, the Sebastopol-based label played a key role in developing highly sought-after original master recordings on vinyl (including a Beatles LP box set that still fetches thousands of dollars on the collectors' market), 24 bit/96 kHz DVD-audio technology, and 24 karat gold-coated Ultradiscs of rock, jazz, and classical reissues, including a copy of the Pink Floyd classic The Wall that still brings $400 on the Internet. Sadly, the label fell victim to the financial collapse of its distributor, a development that marked the beginning of a malaise that would haunt the industry for years. "It was a wonderful ride while it lasted," the company announced in a press release shortly before its 1999 closure. Now the label is back with its first new Ultradisc II releases in five years: a gold-plated original master reissue of John Lennon's 1971 classic Imagine, a soon-to-be-released follow-up of Lennon's 1970 Plastic Ono Band album, and the historic Vox recording of Ravel's "Bolero," featuring Stanislaw Skrowaczewski conducting the Minnesota Orchestra. Those much-anticipated reissues--utilizing the Ultradisc/GAIN 2 (Greater Ambient Information Network) mastering system--join a growing catalog of impressive-sounding recent hybrid SACD releases that include titles by Los Lobos, the Kinks, Dave Alvin, Aimee Mann, and Patricia Barber, among others. Mobile Fidelity, an employee-owned business, had a modest beginning. Its founding father, Brad Miller, began his career by recording the sounds of steam engine railroad trains as a teenager during the 1950s, later releasing LPs on his own Mobile Fidelity Records. In 1955 Miller recorded the sounds of steam locomotives for the first time. He borrowed his father's Ampro monaural tape recorder along with a crystal microphone, and recorded passing steam trains from the Burbank tower and at Surf, Calif., where he vacationed with a telegrapher friend. In the fall of 1957, Miller and a friend named Jim Connella decided to record and release a record album of Southern Pacific steam locomotive sounds. The result, released in March 1958, became the first Mobile Fidelity album, catalog number MF-1. They released two more monaural albums before the end of the year. In September, Miller traveled through Wyoming, Colorado, and Nebraska, recording locomotives while living on hamburgers and sleeping in his car. His equipment had been upgraded to an Ampex 601-2 tape recorder and a pair of Electro-Voice microphones. The trip resulted in Highball (MF-4), Mobile Fidelity Record's first stereo album. High Fidelity magazine praised the release. While recording the sounds of steam locomotives, Miller on occasion had captured other outdoor sounds. He began thinking about expanding the soundstage of his recordings to give the listener a more panoramic environmental experience. Steam Railroading under Thundering Skies (MF-8), released in September 1961, featured the sounds of locomotives combined with rainstorms. Billboard magazine selected the off-beat recording as their "specialty pick of the week." In 1965 Miller stepped into the music arena when he founded the Mystic Moods Orchestra (aka Nature's Mystic Moods), which mixed the sounds of machines and/or the environment with orchestral music. That phase in his career came about through something of a fluke. One night in 1964, DJ Ernie McDaniel of KFOG-FM played Steam Railroading under Thundering Skies on one turntable and music on his other turntable, and broadcast both simultaneously. The station's phones lit up and hundreds of requests to hear the combination poured into the radio station. The Mystic Moods Orchestra's debut recording, 1965's One Stormy Night, released on the Philips label, took its cue from that experience. The album consisted of light orchestral instrumentals and Miller's recordings of rain, thunder, and trains. According to the All Music Guide, the liner notes featured vaguely psychedelic poetry and detailed technical explanations of the microphones, mixers, decks, and other equipment used to record the album. It became Philips' most popular release that year and Miller later released several similar titles. In 1977, Miller created the Mobile Fidelity Sound Lab and continued to produce projects with the label until his death in 1998. Now the label is back on track and essential listening if you're a lover of great sound. "We . . . believe that technological development serves best when accompanied by a profound awareness and appreciation for the elusive magic and mystery that comprises music itself," notes the mission statement on the company's website. That's a mission worth supporting.